I see the pig he said I’d see and pull into the parking lot. 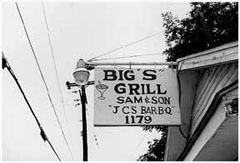 On the side of the building facing the Blockbuster, the “Bar” the “B” and “Q” pig are can-canning, B and Q smiling at Bar, Bar smiling back. Sitting now across the table from Charlie, I try to listen, but who can concentrate with all these pigs up in your business. There must have been ten toilets worth of the porcelain porkers and as many tree trunks worth of wooden ones. So I ask him about them. Joe York: Can you tell me your name for the record? Charles Robertson (CR): My name is Charles Robertson. 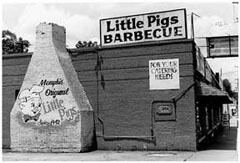 CR: Three Little Pigs Bar-B-Q in Memphis , Tennessee . And what’s your address exactly? CR: We’re at 5145 Quince Road . It’s right at the intersection of Quince and White Station. CR: No. I didn’t found it. 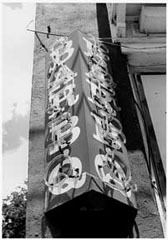 It was originally a Loeb’s Bar-B-Q. 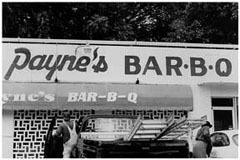 There was… At one time in Memphis there were… There was a man named Loeb that had barbecue places all over Memphis and this was originally a Loeb’s. 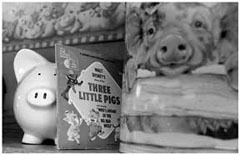 In 1982, a man named Jack Whitaker bought it and took the Loeb’s name off of it and changed it to Three Little Pigs. 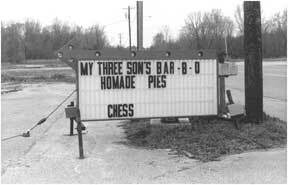 He researched the name, found nobody had it registered, so he changed it to Three Little Pigs. I bought it in ’89. You’ve been running it since then? CR: Yea, I’ve been running it since then. Tell me… Were you associated with it at all when it was Loeb’s? CR: No, nothing other than coming in occasionally as a customer, because I lived in this area. CR: No. Never had. I had worked in the fast food business. 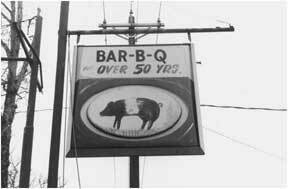 I’d worked for Dairy Queen and Whattaburger and other food places, but never a barbecue place. CR: Right. The recipes came with it, and all the secrets, if you want to call them secrets [laughs]. 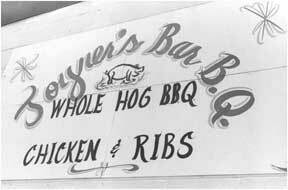 Was there a pit master here that you kept on? CR: Well, if you want to call anybody a pit master it would be Ms. McClendon. 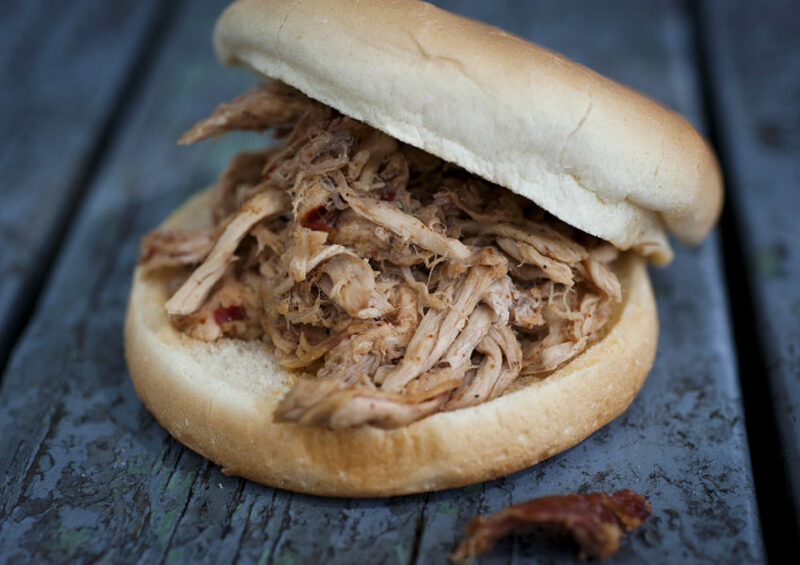 We don’t have… I mean, we never have had anyone we necessarily call a pit master. Everybody watches the pit. Generally, it’s the person in charge or the manager who comes in that determines whether the shoulders come off the pit at that time or not. But as far as just having one pit master, no, we don’t have one. But at that time, when I bought it, since I didn’t know anything about it, I’d say Ms. McClendon. We all listen to her. And she had been here? CR: She had been here. She had been here since the beginning when it was a Loeb’s back in the ’60s.
. I don’t know how many he had. I’d say probably there was fifteen or sixteen of them at one time. So comparable to a Tops or something like that? CR: Yeah, something like that. 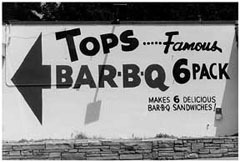 The guy who had the barbecue places, his brother was the mayor of Memphis, Henry Loeb. But I can’t think of the guy… the man’s name who actually owned the Loeb’s barbecue… But anyway, he was the brother of the mayor. But there were quite a few of them. 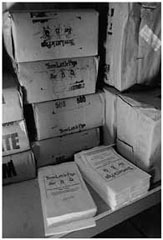 CR: Well, I think it just went out of business and people kept them… Some people kept the Loeb’s name on them and some of them changed them to different things. 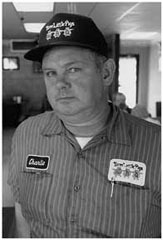 If you’ve been in a bunch of places in Memphis… Have you been in Brad’s, well, not Brad’s [he talks over his shoulder to an employee sitting at the booth behind us] What’s the one over on Summer, Danny, that does all the breakfast stuff? Danny: If it’s [i.e. 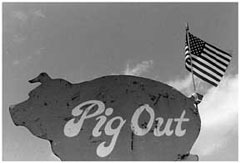 the pig shaped sign] out front, that used to be a Loeb’s. A lot of them have changed… I’ve seen dry cleaners that painted over it. CR: See, [he points to a painting of the building that hangs on the wall above the booth we share] that’s the way the building originally looked, with all the glass. And we remodeled it in ’99, but that’s the way… If you see a building with all that glass… Like Bryant’s has got, all that glass, he’s left his, that was a Loeb’s at one time. And so they had that all glass front. 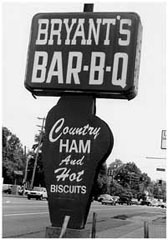 And I think Bryant’s sign… It’s not a pig anymore. CR: Yea, it’s been painted over. CR: The facial features and the fact that makes it look like a pig are gone. But there are a bunch of those signs around town. Tell me about what y’all cook and how you cook it. CR: We cook nothing but shoulders. We never put on chickens or ribs or try to complicate… There’s not much space in this building. The back is real tight, real narrow, very little storage. So, we’ve kept the menu pretty simple. But as far as barbecue, shoulders are all we cook. We cook, most of the time, thirty at a time. We cook five or six days a week. At peak times we’ll cook seven days a week and have an extra cooker we’ll bring up here and cook outside when we have to, when we’re real busy. We load shoulders generally in the morning. First thing in the morning it gets unloaded and reloaded. They’ve been on twenty-four hours. That’s kind of unusual. I don’t believe you’ve probably found anybody else that tells you they cook twenty-four hours, have you? Most people don’t. They cook in a couple of, maybe, five-hour shifts or six-hour shifts. CR: Well, that’s why our barbecue’s a little different than most. We cook at a real low temperature. We cook for a long period of time. The meat stays in there. It’s able to realllly soak up that smoke flavor. Plus, you melt a lot of fat out of it. Now the reason a lot of places don’t cook that long is because, when you’re melting the fat out, you’re losing what they call ‘yield’. In other words, you’re making the meat, the shoulder, get smaller and smaller and lighter and lighter. Whereas, a pound of meat that’s been cooked on a shoulder for ten hours is going to weigh, is going to be… Let me see how I can say it. Of course, a pound is a pound. But you’ve got more grease in that one than you do in this one. In this one you’re going to really… The one that’s been cooked twenty-four hours is going to be leaner and look like more meat… Well, it will be more meat there. You follow me? In other words, if you can squeeze all the moisture out of it, then you’ve got dry meat… And I don’t want it to sound like it’s dry, because it’s not. By cooking it slow, though, we do melt out more of the fat. CR: That’s the secret. Leave them alone. You use good charcoal. We use good hickory charcoal and we use hickory wood and that’s all it is. It’s just a matter of leaving them in there and letting them soak up the smoke. Don’t get it too hot and burn them up. But, no, there’s no turning and basting and talking to them and patting them and injecting and all that stuff. Now, guys that do barbecue contests do all that kind of stuff because they have time to do it, but it’s not necessary. And when you’re doing it to make a living, it’s a lot different, too. Well, tell me about where you get your charcoal and your wood and all that. CR: Well, the charcoal just comes from a company here in town called The Charcoal Man. 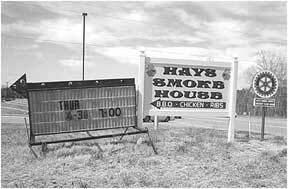 I mean you can buy charcoal from Hardin Cisco, US Food Service… Any of your big food distributors carry charcoal. But we just use a good hickory charcoal… And everybody’s got a different opinion on charcoal. Some people like briquettes. Some people like lump charcoal. I happen to like briquettes. Hickory wood, I get it wherever you can. Sometimes it’s hard to find. I’ve been pretty fortunate that in this neighborhood there have been several big hickory trees cut in the last year or so and the customers bring them to me. They cut them and bring me the wood and give it to me. CR: Yeah, cut it and just bring it to me. You can’t get a much better deal than that. But when I get real low and have to start looking for some, sometimes it’s hard to find and sometimes people don’t know that… They’ll bring you something out here and it won’t even be hickory. I don’t know if you know the difference in a hickory tree and an oak tree. At one time I wouldn’t have. Now, I can tell in the forest with leaves on them, they’re obviously easy. But once they’ve been cut and seasoned out, or course, you know, it depends on whether it’s… There’s two different kinds of bark on hickory. One’s what they call a shag bark or a scaly bark and then one’s got kind of a rough finish, kind of like an oak tree. But we just buy it from wherever we can find it when we need it. And how do y’all mix that up in the pit, the charcoal and the wood? CR: We put the charcoal on the bottom and lay the wood on the top. It really don’t make any difference. The only purpose in the piece of hickory is to create the smoke. We soak it in water, keep it soaked in water all the time so it won’t just go in there and burn up right quick because if it did it obviously wouldn’t give off much smoke. So, it’s soaking in a barrel of water that we keep out there all the time. But generally it’s laid up on top. And you said your pit holds… What did you say? Thirty? CR: We put thirty in it at a time. Now, it’ll hold more than that, but that’s all we put in it at a time. To put more than that in it you’ve got to start turning them all just the right way and doing this and it really makes it hard to get them out if you get them in there like that. But we can cook forty at a time if we really wanted to, but thirty generally is what we cook. 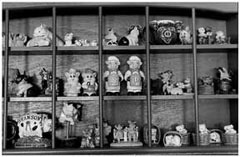 Well, tell me something about all these pigs [referring to the hundreds of decorative plaster and wooden pigs that surround the dining room]. CR: Well, this is quite a collection of pigs. Most of them… I would say over three fourth’s of them have been given to us. Customers bring them in. They’ll take a trip, see a pig, and they’ll bring us a pig. There’s hardly a week goes by that somebody doesn’t walk in and say, ‘We brought you a pig.’ There’s a pig here from Africa. There’s one here from Cozumel, Mexico. I’m trying to think where some of the ones are that came from really far off places. Jamaica. Kind of interesting story, the one from Jamaica is over there and it was brought back and we put it on the shelf and we noticed every morning when we came in there was this saw dust stuff in the floor and we couldn’t figure out where it was coming from. Finally, we determined it was coming out of this pig. And we determined there was some kind of insect in that pig, that was eating… I don’t know if it was like a termite or what it was, so we put him in a plastic bag and tied him up real tight, and put him in the freezer, and left him about a week. And whatever it was that took care of it. And that’s him over there? CR: Yea, the kind of short one. But like I say, they’re just brought and given to us and we always try to find a place… I just got through putting up these two shelves to accommodate some more of the pigs, we had more than we… And I’ve got boxes full of them at home. I mean, I don’t know how many we do have. Have you bought any of them? CR: Some of them I have bought, but not many of them. Like I say, the majority of them… I’m trying to think where there’s one I bought, but… I like to mess around on Ebay like a lot of people do. So, I usually go and look up ‘pigs’ and if I find something unusual… [long pause] I don’t see any of them that I… I bought a few, but not many of them. We’ve got the book over there, the story of the Three Little Pigs. Now, I think I bought that on Ebay. I’ve got a puzzle in the office that I haven’t put up yet that I bought on Ebay. It’s a puzzle of the Three Little Pigs. You see that pink pig with the blue scarf? Now that’s the most recent one. A lady brought that in just last week and gave it to us. It’s pretty impressive that people just give you all of these things. CR: Well, they do. Well, they just… I don’t know, they see a pig and they think of us. So, y’all have that kind of relationship between management and clientele? CR: Yes we do. This is different from most of your… For example, Corky’s up here. World famous. Totally two different places. I mean this is a little neighborhood place. People come in. They know me. They know me by my name. I know them. You know, it’s just real comfy, cozy atmosphere, and everybody’s friendly. 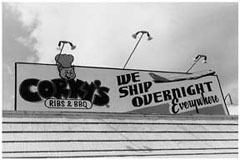 The same people eat here day in and day out. We’ve got customers who’ll eat here three times a day [pause] because we’re open for breakfast, too. CR: No, no. We serve a regular… We’ve got homemade biscuits. We fry eggs. We cook eggs just like you order them, over easy, over medium, whatever you want. We’ve got bacon, sausage, country ham, gravy. It’s a regular country breakfast, you might say, but, it’s pretty well the same clientele over and over and over. And the people who work for you, are they family, family and friends? CR: A lot of them are, but not everybody. I mean, I’ve got thirty people on the payroll, so they’re obviously not all family. But I’ve got three sons, my sister, my sister-in-law, my daughter-in-law work for me, but the rest of them are just hired. But of lot of them have been with me since I’ve been here. The lady that’s back there working with Ms. McClendon now, she was hired when I bought it and she’s been here thirteen years just like I have. A lot of the ladies on the day crew are ten and twelve years. Most all of them are ten and twelve years, which is kind of unusual. They’ve been here since you bought it. CR: Just about, yeah. Some of them came a year or two later, but some of them have been here since I bought it. CR: No. Ms. McClendon is the only holdover. She’s the only one left. But there wasn’t… The place didn’t employ but about six people when I bought it because it wasn’t doing anything. And now you’ve got thirty. CR: Well, it does, but, you know, a lot of those are part-time kids, which you’ve got to realize don’t work but two or three days a week. Just working registers and stuff like that? CR: Yeah, work the register. Work the grill, because we serve hamburgers, and we’ve got hot dogs and french fries and onion rings and… Ms. McClendon stays on the board and handles the barbecue. She takes care of that. And she does the sauce as well? CR: She stays here at night and makes the sauce, makes the beans, used to do all the slaw, but she can’t do it all anymore. 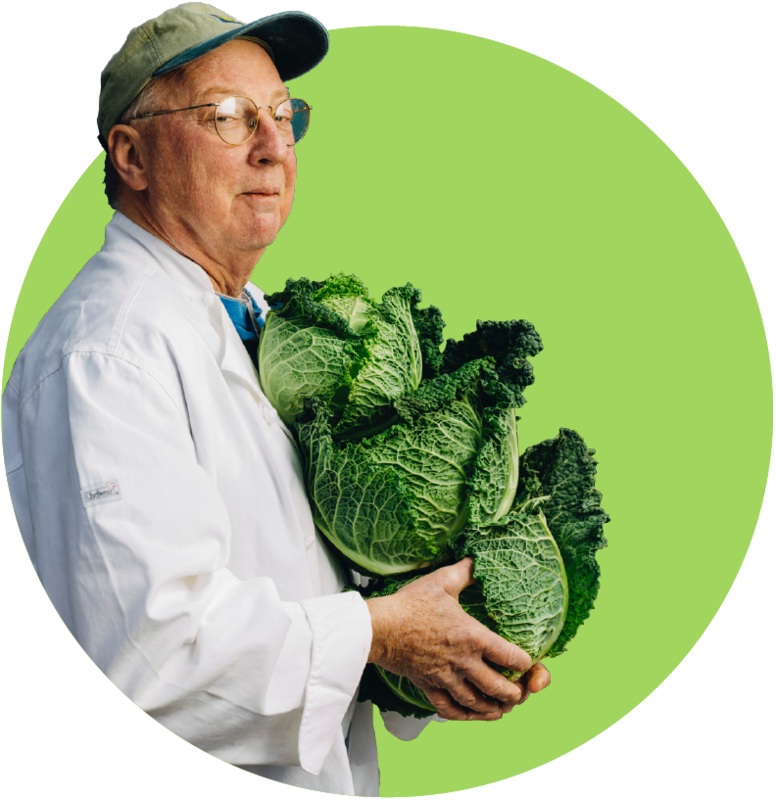 She’s seventy-nine years old so she doesn’t do… We do the slaw during the daytime now. But she used to do it all. But she does do the sauce and the beans at night after everybody’s gone. And you just walk out, lock the door, and let the meat cook? CR: Yea. Make sure the temperature’s where it’s supposed to be… The type of cooker we use is one of these manufactured cookers, has a gas burner in it in the firebox so when the wood and the charcoal burn out, instead of the temperature just going down, the burner will kick on and maintain an even temperature. It operates on a thermostat… That’s another thing that makes ours a little different, is you get that even cook. We had a charcoal pit right there in the front of the building, right where that metal thing is, for years and years. 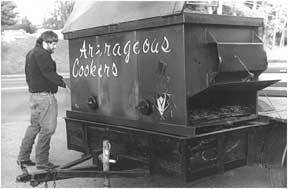 And the good thing is the flavor’s a little different if you’re cooking a hundred percent over charcoal, but the bad thing is you’ve got temperature up and down and up and down, or you’ve got to have somebody stand there really watching it close, which we didn’t have. It’d get too hot, get too cold, so with this type of cooker we use, like I said, if the temperature starts to fall, the burner kicks on. So, we keep an even temperature in there. Y’all do catering as well? CR: We do some. We don’t do a whole lot. Don’t really want to do a whole lot. We’ve just got all I want to do right here. But, yeah, we do some. I try to talk people into just letting me deliver and get it set up and let them feed themselves rather than us stay there and serve it. We can do that, and we do that some, but I try to talk them out of it. It just requires too many people, too many man-hours… And that’s the hard part, finding somebody to work. They don’t want to come out and work for two hours, most the time. 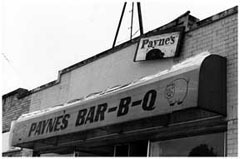 Why did you decide to buy the barbecue place? CR: Well, I had some experience in the food business and I liked the food business. I always did. I always wanted to have… I don’t know. 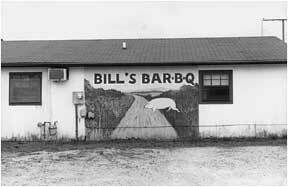 I never dreamed of having a barbecue place. I always figured that if I had something it would either be an ice cream stand or maybe a little hamburger place or something. But I was the bread man here. I had a bread route and delivering the bread here I had… Of course, the man who owned it knew that I had food experience because he and I talked all the time, and I just walked in one morning and he said, ‘How would you like to own a barbecue place?’ And I said, ‘Well, I’d like it.’ But I said, ‘I can’t afford one.’ I said, ‘I can’t buy no restaurant.’ He said, ‘Yeah, you can buy it. If I fix the price right you can buy it.’ So, anyway, we worked out all the details and we did [i.e. swap ownership of the restaurant]. And I kept my bread route and… Actually the lady we were talking about a minute ago, Sandy, started with me. She ran it. That’s why I hired here. Of course, my bread route was out here, so I was in and out all day checking on things and helping them when I needed to. 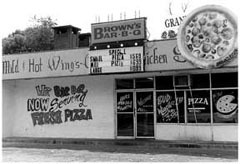 Sometimes I’d stop and work here during lunch and then get back on the bread truck and go do my other stuff until it got to where it made enough money I could make a living out of it. But that’s really how I ended up in it. I knew it had potential. No one had ever stayed here and really watched it and taken care of it. I delivered the bread here for about seven years, so I knew a little bit about it. It was making money when I bought it, not a lot, but it was making some. But the people that owned it wouldn’t invest any of the money back in it. The place was dirty. It was grungy. It had an old, nasty looking floor. All the equipment was falling to pieces. They just… Every dime it made, they just took it and left with it. So, I knew there was potential there. Or, I thought there was. I didn’t maybe know, but I thought there was. CR: A customer of ours was in here that’s like a builder or a remodeler. He’s one of these guys, he’ll come in and he’ll draw all over napkins. He’ll get through… He’ll have napkins everywhere where he’s designed and drawn stuff. He’d been in here one morning and he said, ‘Come here. I want to show you something.’ And he had napkins laying out all over the table, and he had drawn a picture of the building looking like that right there [he points to a framed painting of the building as it looks today which hangs on wall above the booth where we are talking]. He said, ‘That’s what I want to do to your building.’ I said, ‘You do.’ And first I just sort of shrugged him off and laughed about it and he came back then with some plans, really on paper, that showed it more clearly, and he made it… convinced me how easy it would be to do. We would never have to close. It could be done while we stayed open and it wasn’t expensive. He was very reasonable. Like I said, after he convinced me, we lit in to it. We started in about the middle of November in ’99 and it took him until maybe the middle of January of 2000 before he finished. CR: Everybody loved it. First of all, we picked up some seating. If you can tell where the blue tile is, where those poles are is where the glass used to be. That blue tile was the sidewalk that went around the outside of the building. So, we picked up another ten seats, but it just made the place… We put a new ceiling in. We dropped the ceiling. Put all new light fixtures, which added some light, brightened it up. Put all new fixtures inside. We never had… I never heard one negative comment about it. People really… And the fact that you had all that glass, you couldn’t heat it or cool it. 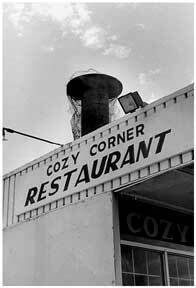 Only when the temperature was ideal outside was the dining room comfortable. When it was real hot with that west sun blazing on that glass, I don’t care how much air conditioning you had, it was going to be hot in here. And in the wintertime it was cold because you had all that glass radiating that temperature through. So, I wasn’t really concerned about that part. I knew that would be fine. Well, is Ms. McClendon around? CR: Yeah, she’s here. You want to talk to her a minute? CR: Helen. Helen. Helen! Mr. J! CR: Sit down here, Helen. 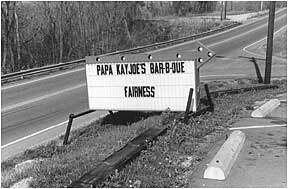 He’s just asking some questions about the barbecue place. CR: You can answer some about how it was a long time ago and how long you been here and all. HM: I came in ’69. It was Loeb’s. HM: I had a franchise from Loeb and kept it ten years and then it was sold, sold six times, different people. HM: It looks like it, doesn’t it Charlie? Yeah. So, you’re the main cook here? HM: No. Used to be. From ’69 to ’79, yeah, because I had it then. HM: Yeah, it was mine. Franchised from Loeb. HM: I sold it in ’79. But stayed here and continued to cook the meat? Well, how did you get into cooking barbecue? How did you get started doing that? HM: Well, my ex-husband, he had left me and he said, ‘I think you can make a living down here if you franchise it from Loeb’s.’ So I did. I came from Bolivar down here. This was after you and your husband divorced. You came down here. HM: Came down here and I kept it ten years. Sold it in ’79 and another person bought it and then another one and another one and they didn’t keep it long. They just kept on. So, it was six of them before Charlie bought it. HM: At Western State Mental Hospital, uh huh. Mental institution. HM: I just had to make a living. Yeah. [laughs] So I came down here. Well, how did you learn to barbecue? How did you learn to cook the meat? HM: The one that was here that was working for Loeb showed me. They showed me everything. Well, what do you do now? What’s your capacity here at the restaurant now? HM: I just work at the counter, and make beans and barbecue sauce. I don’t fool with meat. Well, tell me about the sauce. What kind of sauce do you make? HM: We make barbecue sauce. HM: We make it up, mix it. So, it’s a sweet sauce. HM: Well, I just like the work. It was a good business. Well, tell me about some of the… Do you have any customers you remember? HM: Oh, yeah. They all know me. [laughs] From way back there, um huh. Tell me about what this place was like before it was changed and renovated? HM: [she turns around and looks at the picture hanging above the booth behind her] Yeah. That’s the way it was. Throughout the years how have you seen this area change? HM: Yea, uh huh. It’s a good area, though. Good people around here. HM: I lived in different places and then on Perkins, uh huh. And now I live in another place. HM: I have two daughters. HM: Uh, uh. They did when I had it. They both worked. Well, take me through like a regular day for you. HM: Ok. I had someone open up for breakfast and I came in at eleven and stayed until that night. I worked fourteen hours everyday, seven days a week, through dinner and through supper. I had two or three… We didn’t have as many employees as he has. But, I had two or three ladies and then some young people at night helped me. I had to do the cooking, had to do the shoulders and making everything. Well, now, the ladies helped me on the making things in the mornings. But, I did it all and that’s the reason I sold it in ten years. [laughs] It was so much work. Because, I didn’t have anybody to help me, I mean, no family. Well, my daughters helped some, but they were working other places, too. They had other jobs. So, I don’t know. There’s just not much to tell. It’s just work. So now you just make the sauce and… How many days a week do you work? HM: I work five days a week. HM: Uh huh, eight hours a day. You ever think about retiring? HM: [laughs] Can’t afford it. HM: Uh, huh. I used to work seven days a week all the time. You’re just here all the time, then? HM: Oh, yeah. I’ve enjoyed it. Yeah. I like to be with the people. That’s the reason I sold it because I couldn’t stay on here like that. I mean, fourteen hours a day, seven days a week gets tiresome when you got a family at home, too, some children. And, I don’t know anything to tell. Now, the one I sold it to put in those machines and then that ruined some of the business. HM: Those pinball machines, uh, gambling machines. But then he didn’t keep it long. He sold it to somebody else, see, and they took it [the machines] out. 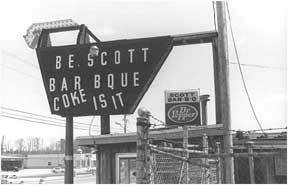 So, it’s a good barbecue business. Have you seen the barbecue, the meat itself, change at all from owner to owner? HM: Uh, uh. No. It’s stayed the same. HM: Uh huh, always the same. HM: No, I liked them all. Yeah. They’ve all been real nice? HM: Uh huh. They’ve all been real nice. Do you remember any of their names from when you started to now? HM: Yeah. I sold it to Mr. Strong. He’s the one that wanted it for these machines, put in the machines, Mr. Strong, but he didn’t stay here long. He sold it to Cathy and Ronnie Dillard. They couldn’t make a go of it. So, they sold it to Dan and Mona Atkinson and they stayed here about five years. And then they sold it to Mr. [pauses to thin]… a banker, he’s retired from the bank. He wanted it for a hobby, but he found out it wasn’t a hobby. [laughs] So, he kept it a little while and sold it to Charlie. And Charlie’s had it since. HM: He knows how to do better than the rest of us did. Well, how is that do you think? HM: I don’t know. He’s just a better owner. [laughs] Just a better businessman I guess. And then he caters a lot, too. So. So tell me about… Do any of these pigs around here belong to you? HM: Oh, no. I didn’t have any of this. He’s changed it up like that. Charlie did. Do you have a favorite pig? They don’t bother you very much? HM: No, they don’t bother me. No, he’s redone it all, floors, building and everything. So, it’s a good place. Do you eat the food here a lot? HM: Not right now, because I just can’t eat barbecue right now, but, yeah, everybody likes it though, all of them. You get a lot of people coming in here over and over again? Do you have some customers that really stand out to you? People that you like to see come in the door? HM: Yeah, there’s some that come here every night just to sit and talk. And some of them eat about every night, eat supper here. Do you sit down and talk with them? HM: No. We’re usually too busy. We’re usually too busy. But anyway, they sit and talk to each other. There’s two or three men that come in and sit and talk to each other. HM: No, I work night shift. You work the evenings only. So from when to when? HM: From four o’clock to… I get out about eleven at night. HM: [laughs] About eight o’clock or nine, somewhere along in there. Do you like the night shift? HM: Oh, yeah. I’ve always worked the night shift [pause] with all of them. When nobody else is here what are you doing back there? HM: I make barbecue sauce and beans, whatever. When they’re all gone. o’clock, ten, whatever time they get through mopping, cleaning up. Are you ever scared being here late? HM: No. I was robbed one time when one of the owners had it. Do you mind talking about that? HM: They didn’t shoot me [laughs]. HM: It was two colored ones, yeah. HM: Yeah. Put the gun over the counter and told me to get my money in that sack right now and I gave him… I believe I gave him sixty dollars. I didn’t give him all of it. [laughs] It’s a wonder they hadn’t shot me. But they ran out with it. You’ve just never been scared since then? So you lock up and go home at eleven? HM: That’s right. Sometimes I get out earlier. Just depends on how busy we are. How much sauce do you have to make? HM: I just keep the shelf full. It’d be twelve or thirteen gallons I think, Somewhere along in there. I just keep them supplied for the next day. HM: Just passed down. It’s been the same. It was good. They all like it. Well, do you know anything about this… You got the logo on your shirt there with the pigs. Do you know who came up with that? HM: Mr. Whitaker. Jack Whitaker. 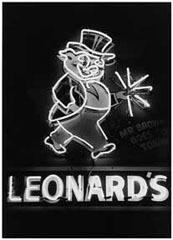 He changed the name from Loeb to Three Little Pigs. HM: No. Charlie did that, I guess. I don’t know. There’s a lady that does it. 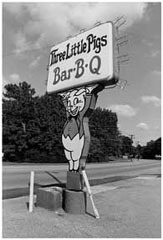 But, Mr. Whitaker changed the name to Three Little Pigs from Loeb’s and it’s been the same name the whole time. We’ll ask Charlie. 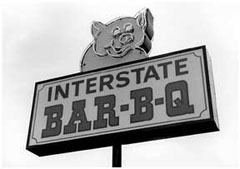 Can you tell me about the logo, the dancing pigs, who came up with that? CR: Jack Whitaker I guess did didn’t he, Helen? CR: He had that put up there. It was there when we got it. 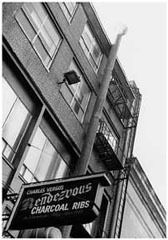 I know when Jack bought it he took the Loeb’s sign down and he’s the one that put that up. Now, where he got the logo from I don’t know. He told me that the name had been registered at one time in the state of Tennessee with the Secretary of State and he [Mr. Whitaker] did a research and found that they had let their registration lapse. So, he went in and just took the name. He didn’t register it. He didn’t bother to register it. But when I bought it, I did register it. It is registered. Nobody can use it in the state of Tennessee. They can use it anywhere else. But I don’t know who originally designed that logo. HM: I don’t know who did. 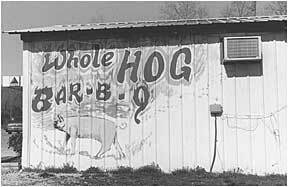 That’s part of what we’re interested in, is like, barbecue art as well. You know, the different paintings of pigs and all that. CR: I don’t know who originally designed it. Like I said, he’s the one that changed the name and put that up. So, evidently he knew… He found it somewhere, I guess.